I was pleased to discover that Elemental Mixology was quoted in the Negroni article by Simon Difford and Karen Fick. Thank you, Simon and Karen! I do want to make clear that I do not consider any of the drinks mentioned to have necessarily ‘come from’ any of the others. The late-ancient Greek scholar, Diogenes Laertius (or perhaps his now non-extant sources), saw connections in thought between various of the ancient philosophers and presented his book, Lives and Opinions of Eminent Philosophers, in chronological, tidy, student-pupil relationships. By focusing on personalities and relationships, he seems to have missed much of what was remarkable in the development of philosophical thought — the most important aspect, really. Likewise, it would be a gross error of over-simplification to say that the Dundorado Cocktail begat the Campari Mixte Cocktail, which begat the Camparinete Cocktail, which begat the Negroni Cocktail. What is more likely is that people naturally experimented with slightly modifying gin-based cocktails that were sweetened with vermouth wine. This required virtually no inspiration – vermouth wine was practically the default sweetener in all new true cocktails created after around 1900. The success of the Martini Cocktail had established that specifically gin-based cocktails sweetened with vermouth wine were worth experimenting with. Furthermore, cinchona bitters (such as Calisaya and Campari) had been getting the attention of bar-tenders and drinkers since the 1890’s. Such true cocktails as the 1895 Dundorado, the 1929 Campari Mixte, and the 1934 Camparinete (all that might be called ‘the Negroni’ today — or versions of it) would have been obvious drinks to make to any slightly-curious bar-tender. We can’t really be surprised (or even consider it inspired) that multiple similar recipes would show up in exactly the time-frame they did — independently of each other. “Who invented the Negroni?” ‘Invented’ – don’t make me laugh! Given the understanding of drinks at the time, combined with the availability of the products needed, it was always going to happen, sooner or later, in one place or another. Whoever first mixed a drink that would be called ‘the Negroni’ today probably barely beat out the next guy who made the something very similar not knowing anyone else was doing it. Such a drink was almost surely made by multiple bar-tenders before one of them happened to become more widely known and published. P.S. – None of this should be interpreted as my saying that Simon Difford and Karen Fick have written a ‘begat’-focused history of these drinks. Their article doesn’t necessarily read that way. One of the things I am sure to mention at least once in any mixing course I teach is that what people think of today as the ‘classic Martini’ [dry gin, dry vermouth, no bitters, stirred through ice, strained into the goblet and garnished with a pickled green olive] was more-originally called the Gibson. Often someone will say that they thought the Gibson was “a Martini with an onion in it” [instead of the olive]. That’s to be expected — I was taught the same thing years ago. At that point I show the historical record of the Gibson, to indicate that there being no bitters in the drink was much more important to its identity than the olive (yes, olive — not onion) that was the earliest-mentioned garniture for the drink. The slide show starts with the following image. But what of “a Martini with an onion?” Where did that come from? Maybe it came from the Hanford Cocktail. I found this drink mentioned in the Saturday, July 13th, 1912 edition of the Tacoma Times. All those so-called Gibsons might actually be more historically accurate if called Hanfords! Before Elemental Mixology was relocated to Portland, there were almost always more people intent on becoming cushion subscribers than there was room for. Here in Portland, plenty of cushion is available for subscription. By the autumn, that will probably no longer be the case! Between 1898 and 1900, a group of plutocrats that commonly ensconced themselves at the bar in the Waldorf Hotel in Manhattan, New York, maintained a coach, driver and horses to take them from the Waldorf bar to other exclusive drinking establishments and back to the Waldorf Hotel at their whim. They named the coach the Good Times Coach. The Waldorf Hotel Bar’s Good Times Cocktail (later generations of debased drinkers might think of it as the ‘classic’ gin Martini with orange bitters) was named after the Good Times Coach. 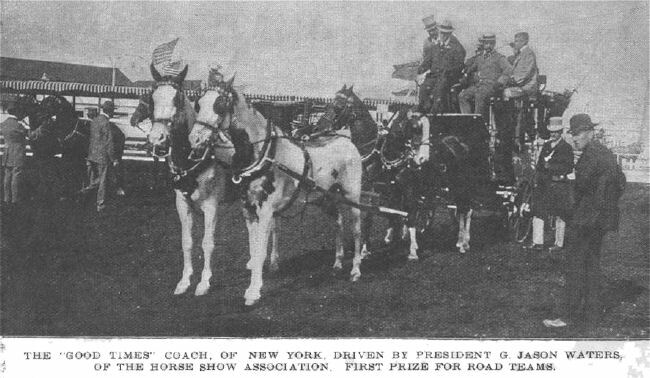 In 1900, the Good Times Coach was awarded first place in the luxury road team category at the national equestrian exposition at the Madison Square Gardens. In what may have been the most sophisticated pub-crawling of all time, the few men who contributed to the cost of the maintenance of the Good Times Coach had use of it to travel between drinking destinations all over New York City. Those men were referred to as cushion subscribers. An Elemental Mixology Annual Cushion Subscription enables the full attendance and participation of all courses and symposia (except for the shorter Brief and Casual classes) for the duration of the subscription. 1) Elements, their ingredients, nature and how they present in drinks in all possible proportions. 2) Traditional genres of drinks, which elements they depend upon for their best character, and how to mix them without needing to memorize recipes. 3) All specific drinks that have been important in American bars, saloons and hotels from 1750 to present will be second nature. Many of these drinks are now almost impossible to order in any bar, and real advantage attaches to being able to make them well and with familiarity. 3) The important aspects of various liquors, including much knowledge that is often glossed over or not fully understood by most in the industry today. The main flavor-making stages of production will be understood: duration of fermentation, type of distillation and aging. The two major overall types of liquor production, the wasser and geist methods, will also be fully understood. Liquors selected to elucidate specific qualities differences will have been tasted numerous times. 4) Many other items of knowledge and experience that will not be laid out here for various reasons! For anyone making full use of an Elemental Mixology Cushion Subscription, the discount is massive. Get a Cushion Subscription here.